The small city of Kenner made national news the other day by refusing to allow Nike to be a part of booster clubs who participate in the city. I will go over the memos sent by Mayor Zahn and the implications that go far behond Colin Kaepernick. Hurricane Florence is bearing down on the East Coast and Hurricane Trump is trying his best to cause problems for people during and after the storm. Remember, Water is very wet. And if we are able to, I will be talking to Lee Dugas, yet another candidate in the LA01 race for Congress against Steve Scalise. Lee has been on the program before and I will be happy to have her on if she has time. Those issues and more this Wednesday at 8pm Central on Liberal Dan Radio: Talk From The Left, That’s Right. Yesterday was one of the most damning days of the Trump Presidency. Multiple convictions on multiple counts of people who were very close in Trump’s inner circle. Where does the country go from here? Those topics and more on Liberal Dan Radio: Talk From The Left, That’s Right. Donald Trump picked his nominee to replace Justice Kennedy. What does the future hold? Could Trump have more tricks up his sleeves with this pick? What are my concerns? I will also go into more of what I missed out on for last week’s show. Those topics and more this week on Liberal Dan Radio: Talk From The Left, That’s Right. Donald Trump will be reshaping the courts for decades to come and the Democrats cannot solve this problem by their own. No legislative solution exists where the Democrats can, by themselves, prevent an extreme right wing shift to the courts. Here on Liberal Dan Radio and in other places, people tried to warn you. The Supreme Court was the most important issue facing this country in the 2016 elections. However, people were fooled into thinking other things were more important. In this episode I will review the changes to this country that have taken place already since the last broadcast and talk about where we go from here. So listen live on Wednesday, July 4th at 8 pm Central on Liberal Dan Radio: Talk From The Left, That’s Right. I will also be discussing the case of the Nurse in Utah who refused to draw blood when ordered to by police. Those stories, Hypocrite of the Week, and more tonight on Liberal Dan Radio, Talk From The Left, That’s Right. Remember, you can support the show and/or buy advertising on the Liberal Dan Radio GoFundMe page. Thanks to Ross Bugden – Music on YouTube I was able to make my show intro with royalty free/copyright free music. On this week’s Liberal Dan Radio, Talk From The Left, That’s right. I will review a few things from last weeks show that got messed up because of the faulty audio issues that I was having. I will then go into a discussion about how Donald Trump’s policies have been shown to be even more dangerous because of Hurricane Harvey. I will also discuss some hypocrisy that goes in because of Conservatives and their “small government” agenda. Those topics, Hypocrite of the Week, Words of Redneck Wisdom, Tweet of the Week, Headlines, and your calls this week at 8pm central on Liberal Dan Radio: Talk From The Left, that’s right. Please support the show by contributing to the Liberal Dan Radio GoFundMe. Thanks to Ross Bugden – Music on YouTube is where I got my show intro here. Racism is alive and well in this Trump Presidency. I explore that for a little bit and then open up the conversation to anything that you might want to talk about. Other issues that might get discussed include the Alabama primary for their open Senate Seat, creative resignations, and more. I will also have another full lineup of bits including Hypocrite of the Week, Tweet of the Week, Headlines, and Words of Redneck Wisdom. 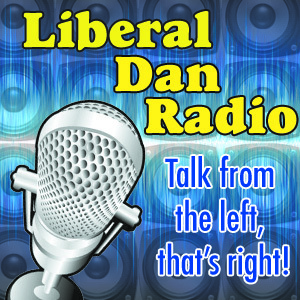 So tune in Wednesday at 8pm Central for Liberal Dan Radio: Talk from the left, that’s right. And remember you can support the show by making a contrabution or buying advertising on the Liberal Dan Radio GoFundMe. And if you are listening after the live broadcast you can leave your comments on the show thread at LiberalDan.com. Liberal Dan Radio: 8/16/2017 – What did I miss? #LiberalDanRadio returns triumphently to discuss the last 8+ months and especially the recent happenings under the Trump Administration and Charlottesville. Donald Trump is acting like a mad man pounding his shoe on the podium in front of the whole world. Will he actually lead us to nuclear war? His words seem to make some people think that he is itching for it. Riots in Charlottesville, Va lead to the death of one protester and a large debate. Especially on if it is ok to #PunchANazi. In my neck of the woods, New Orleans flooded for no good reason and many bad ones. I will discuss that a little if there is time. Those stories, plus the return of words of redneck wisdom and maybe more, Wednesday at 8pm Central on Liberal Dan Radio: Talk From The Left, That’s Right. Thanks to Ross Bugden – Music on YouTube, I have new show intro music. Check that video out here.